The term ‘rocket’ comes from a French word ‘roquette’ which means a tall thin cylindrical object. The word rocket can mean different things to different people. Some people consider rocket as a vehicle that can take them into space while others know it as an engine. Going by the definition of Wikipedia, a rocket is a missile, spacecraft, aircraft or other vehicle that obtains thrust from a rocket engine. The first rockets that we know of, were invented in China in the 1200s in the form of fireworks. 700 years later they made bigger and more efficient rockets which found their use in better fireworks. This science then became so advanced that finally in 1969, USA took man to the moon using rockets of advanced technology. But having said that, rockets are mainly divided into two major categories. A rocket comes in many shapes and sizes ranging from a simple tube filled with gunpowder to a sophisticated fuel efficient injection system. Rockets are designed to make sure they overcome all the obstacles they face while executing their function. Most of them have an aerodynamic shape to counter thrust during high speeds. Now I must warn you against confusing rocket propulsion with jet propulsion. They both work on different principles. A jet needs air to work and uses the drag force of the air to propel itself forward. Jets usually don’t work in space. On the other hand, rockets work on the burst of energy produced when a fuel is burnt under high pressure. Rockets can easily travel in space. Rockets work on the principle of Newton’s third law i.e. every action has an equal and opposite reaction. In simple terms, when the fuel is burnt inside a rocket, it creates a thrust downwards which propels the rocket in the opposite direction. As simple as it may sound, rocket propulsion is considered to be one of the most difficult sciences that exists till date. In fact, “rocket science” has become a commonly used phrase in English to describe something “very complicated”. 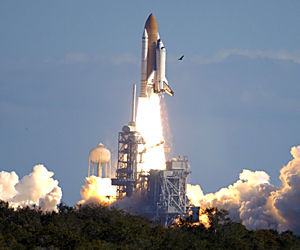 Since space exploration is limitless, rocket science is considered to endure a long time. Scientists don’t see rocket science getting outdated anytime soon. Hence, more and more engineers and scientists are taking up this field because of its tremendous demand. And as long as rocket science is in business, space rockets are bound to be there till the end of human race.